March Madness starts Tuesday. Get those brackets ready! 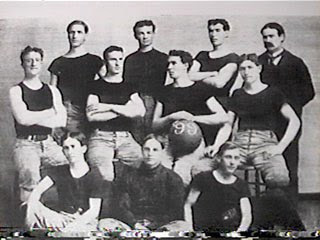 (If history means anything: the first college basketball team, Kansas, 1899 with Coach Naismith, the man who invented the game). oh, thanks for the reminder...my jock husband's tradition is to watch this incessantly!!! That's right NYC Jayhawk!!! We went to the semifinal game last night for the Big 12. It's K State against KU tonight. WOOT! Yet another chance to woop the Wildcats rears! LOL! Love the vintagey pic. I collect vintage KU cheer photos... I have some back to 1919. Cool. When I married a Jayhawk, we had a prenup: OU (my alma mater) football and KU basketball. It got a little dicey in 1988! Today we are all blue. So glad to see Jayhawks sprouting up everywhere. I write this from the mothership: Lawrence, Ks. Just got back from spring break (austin, tx) and was catching up on my blog reading. Saw your KU post and sent it on to a rabid fan/friend that lives here in town, then went out to get the Sunday paper and the headline read: HOW SWEET IT IS! I'm living in Waterloo/Cedar Falls, Iowa and the UNI team is local - attended there myself for several semesters. Sorry, I know we were supposed to lose.